A contemporary home for the architect, his wife, and two young sons that had its beginnings in an earlier “country home”a former family retreat from San Francisco, when Los Altos was still regarded as a trip to the country. Built in 1919 originally for the family of Dr. Jean Haber Green, the main house was of constructed by a Mr. Talmadge, considered a master carpenter by Architect Bernard Maybeck, possessing an interior rich with exquisite redwood cabinetry and panelling. The five acre property itself was once part of a Spanish land grant and filled with magnificent live oaks. In 1951, when Aaron Green moved his family and practice northward from Los Angeles, they were living in a rather cramped cottage upon the lot, while Jean’s aunt, Gertrude Pauson, occupied the main house. 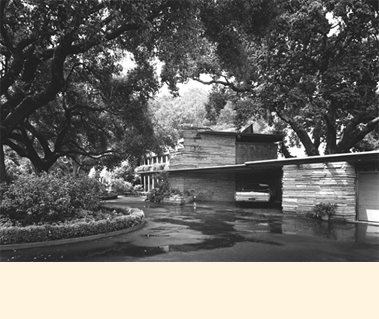 Ms. Pauson and her sister Rose had commissioned and built in 1939 a wintering home in Phoenix, Arizona designed by Frank Lloyd Wright. In 1954, with the passing of Gertrude Pauson, Aaron Green and his family moved into the two-story main house, with Aaron embarking upon an ambitious plan for its expansion. With no desire to destroy the beautiful workmanship of the original house, it instead became the nucleus of a new design and informed the thought and detailing of the addition. The beamed, high-ceiling living room of the original house was converted to a study and office for Aaron Green. A brick fireplace, the finely detailed redwood carpentry and panelling were left untouched.. The adjacent dining room was left unchanged as well, though the kitchen behind was completely modernized. Beyond, a newly created passage led to the new addition, a vast open, space of 1,400 square feet which could encompass all types of family activity. It served as a living space for entertaining and music, as well as containing areas for Jean’s desk and weaving loom. There was a coved fireside area, which provided a secluded retreat for conversation and reading. The second floor of the original house was occupied by the two sons and their shared bathroom, all reached from an earlier wood stair at house center, which landed at a mezzanine overlooking the converted study. A new broad, open stair was added in the transition which led to the second floor addition containing the master bedroom suite. Doors opened onto a broad deck that served as the roof over the living space below. The addition was an open reflexive arrangement of partitions and structural elements compositional geometry of 30° and 60° angles. A skillful design merged all gracefully with the traditional square original house. The majority of solid walls were constructed of Arizona kaibob stone, much of which was built by Aaron Green on his weekends. Walls toward the landscaped rear yard were entirely framed in sheets of floor-to-ceiling glass and dissolved all visual barriers between indoors and out. The broad terrace beyond, with added swimming pool, become an extension of the living space. Another cottage on the property was moved adjacent to the swimming pool and was remodeled to serve as a cabana and guest house.